A chordoma is a form of cancer that affects the spine. It is thought to originate in cells that formed the notochord, an early structure in the embryo that develops into the spinal cord. If some of the cells from the notochord do not differentiate fully, notochord remnants can be left at the top of the spinal cord, near to the brain stem, and at the bottom, at the base of the back. These cells can start to grow out of control and chordomas occur mainly in the lower back, where one of the main symptoms is chronic and difficult to treat back pain. 50% of all chordomas occur here. Of the rest, 45% occur in the brain, at the base of the skull or in the face. 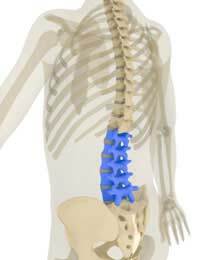 In the remaining 5% of cases, chordomas develop at other points along the spine, affecting individual vertebrae. No, this type of spinal tumour is extremely rare, affecting only about one in a million people worldwide. In the UK, there are around 20 new cases each year. As the tumours do sometimes occur in the same family at a higher frequency, it is possible that there is a genetic basis for chordomas and researchers are trying to identify the genes that might be involved. So far, only the brachyury mutation has been definitely associated with some cases of chordoma; this is a mutation in a gene that plays an important role in spinal cord development. Chordomas are slow growing but malignant tumours; they rarely affect children and are most common in men between the ages of 40 and 60. They rarely spread but if metastases do form, these are likely to be in the liver, other bones, nearby lymph nodes, the lungs or the skin. The first step towards diagnosis is to look at symptoms and rule out other common causes. The main symptoms caused by chordomas vary depending on the site of the tumour. If the tumour arises in the skull, at the top of the pain, this can affect the ear, causing loss of hearing and loss of balance, or it can affect the eyes, causing double vision and other problems. Headaches are common and the person affected can develop pain in the face and have problems swallowing. Lower spinal tumours cause back pain, which is chronic and difficult to relieve, problems with bladder or bowel control, impotence and problems with the legs. Muscle weakness and pain in the legs can occur. If other causes have been ruled out and chordoma is suspected, a referral to a bone specialist for further tests is the next step. For tumours in the skull, a neurologist will be involved, in addition to a maxillofacial surgeon. If the chordoma is in the back or the lower back, a bone specialist and orthopaedic surgeon may be involved. In both cases, CT scanning and MRI scanning can show the size and exact location of the tumour. The only potentially curative treatment currently available is surgery. Not all chordomas are suitable for surgery; those in the brain are particularly difficult to remove completely. If the tumour is at the base of the spine, it may be necessary to remove the surrounding soft tissue to make sure the entire tumour is gone; this can involve surgery that will take away bowel or bladder function, and that can affect sexual activity.Generally, chordomas are relatively resistant to radiotherapy although this is often used in tumours in the spine and lower back. The doses required need to be limited if radiotherapy is used to treat chordomas in the brain. Chemotherapy can also be used, but this is non-specific and will have many side effects, such as nausea, vomiting and hair loss. New hope in the last few years has come from new biological therapies. A small trial of Imatinib, a monoclonal antibody active against tumour cells has been completed with promising results. As chordomas are slow growing, careful treatment can create a period of remission that lasts months and even years; the 10 year survival rate for people with chordoma who are able to have surgery is around 46%. Hopefully, with new treatments, this will improve in the near future.